Tarkhan Tayumurazovich Batirashvili (Georgian: თარხან ბათირაშვილი; 11 February 1986 – 10 July 2016), known by his nom de guerre Omar al-Shishani (Arabic: أبو عمر الشيشاني‎ , was a Georgian Chechen (Kist) jihadist who served as a commander for the Islamic State in Syria, and previously as a sergeant in the Georgian Army. A veteran of the 2008 Russo-Georgian War, Batirashvili became jihadist after being discharged from the Georgian military and served in various command positions with Islamist militant groups fighting in the Syrian Civil War. Batirashvili was previously the leader of the rebel group Muhajireen Brigade (Emigrants Brigade), and its successor, Jaish al-Muhajireen wal-Ansar (Army of Emigrants and Supporters). In 2013, Batirashvili joined the Islamic State and rapidly became a senior commander in the organization, directing a series of battles and ultimately earning a seat on ISIL's shura council. The US Treasury Department added Batirashvili to its list of Specially Designated Global Terrorists on 24 September 2014, and seven months later the US government announced a reward up to US$5 million for information leading to his capture. There were several reports of his death throughout 2015 and 2016. ISIL confirmed he was killed in July 2016 as a result of a US airstrike. Tarkhan Tayumurazovich Batirashvili was born in the Georgian SSR, Soviet Union (now Georgia) in 1986. His father, Teimuraz Batirashvili, is an ethnic Batsbi of Chechen origin, which are orthodox Christians. His mother was a Muslim Kist—an ethnic Chechen subgroup from Georgia's Pankisi Gorge—of the Mastoy clan. Batirashvili grew up in the largely Kist-populated Christian village of Birkiani, located in the Pankisi Gorge in an impoverished region of northeast Georgia. He was one of three sons, all of whom would convert to Islam against their father's wishes later in life. During his childhood, his father was rarely present, as he spent long periods of time working in Russia, and the children were mostly raised by their mother. In his youth, he worked as a shepherd in the hills above the gorge. Later in the 1990s, the Pankisi Gorge was a major transit point for rebels participating in the Second Chechen War, and it was there that Batirashvili reportedly came into contact with the Chechen rebels moving into Russia. According to his father, a young Batirashvili secretly helped Chechen militants into Russia and sometimes joined them on missions against Russian troops. After finishing high school, Batirashvili joined the Georgian Army and distinguished himself as master of various weaponry and maps, according to his former commander Malkhaz Topuria, who recruited him into a special reconnaissance group. His unit received training at the Krtsanisi National Training Centre, which included training with US special forces. Batirashvili was reportedly a "star pupil". He rose to the rank of sergeant in a newly formed intelligence unit, and during the 2008 Russo-Georgian War he served near the front line in the Battle of Tskhinvali, spying on Russian tank columns and relaying their coordinates to Georgian artillery units. According to Business Insider, Batirashvili's unit inflicted serious damage on the Russians, and among the actions they participated in was an attack on a column of the Russian 58th Army during which the commander of the 58th Army, General Anatoly Khrulyov, was wounded. Batirashvili was never decorated for his military service. He was due to be promoted to become an officer, but in 2010 he was diagnosed with tuberculosis. After spending several months in a military hospital, he was discharged on medical grounds. He tried and failed to re-enlist. Upon returning home, he applied for a job in the local police force and was rejected. Around this time, his mother also died of cancer. According to his father, he became "very disillusioned". According to the Georgian Defense Ministry, Batirashvili was arrested in September 2010 for illegal possession of weapons and sentenced to three years in prison. He was allegedly released after serving about 16 months in early 2012 and immediately left the country. According to an interview on a jihadist website, Batirashvili said that prison transformed him; "I promised God that if I come out of prison alive, I'll go fight jihad for the sake of God", he said. Batirashvili reportedly told his father that he was leaving for Istanbul, where members of the Chechen diaspora were ready to recruit him to lead fighters inside war-ravaged Syria; an older brother had already gone to Syria some months before. In an interview, Batirashvili said that he had considered going to Yemen and briefly lived in Egypt before ultimately arriving in Syria in March 2012. His first command was the Muhajireen Brigade, an Islamist jihadist group made up of foreign fighters that was formed in the summer of 2012. His unit became involved in the Battle of Aleppo, and in October 2012, they assisted al-Nusra Front in a raid on an air defense and Scud missile base in Aleppo. In December 2012, they fought alongside al-Nusra Front during the overrunning of the Sheikh Suleiman Army base in Western Aleppo. In February 2013, together with the Tawhid Brigades and al-Nusra Front, they stormed the base of the Syrian Army's 80th Regiment, near the main airport in Aleppo. In March 2013, Kavkaz Center reported that the Muhajireen Brigade had merged with two Syrian jihadist groups called Jaish Muhammad and Kataeb Khattab to form a new group called Jaish al-Muhajireen wal-Ansar, or Army of Emigrants and Helpers. The group played a key role in the August 2013 capture of Menagh Air Base, which culminated in a Vehicle Borne Improvised Explosive Device (VBIED) driven by two of their members killing and wounding many of the last remaining Syrian Armed Forces defenders. A branch of the Muhajireen Brigade was involved in the 2013 Latakia offensive. In May 2013, Batirashvili was appointed northern commander for the Islamic State of Iraq and Syria, with authority over its military operations and forces in northern Syria, specifically Aleppo, Raqqa, Latakia, and northern Idlib Provinces. By late 2013, he was the ISIL emir (leader) for northern Syria and was operating in and around Aleppo Province. He was also in charge of fighters from Chechnya and elsewhere in the Caucasus. Units under his command participated in major assaults on Syrian military bases in and around Aleppo, including the capture of Menagh Airbase in August 2013. He was considered "one of the most influential military leaders of the Syrian opposition forces". By mid-2014, Batirashvili was a senior ISIL commander and shura council member based in Raqqa, Syria. In August 2013, Batirashvili released a statement announcing the expulsion of one of his commanders, Emir Seyfullah, and 27 of his fighters. Batirashvili accused the men of embezzlement and stirring up the animosity of local Syrians against the foreign fighters by indulging in takfir—excommunication—against other Muslims. However, Seyfullah denied these allegations and claimed that the dispute was due to his refusal to join ISIL with Batirashvili. In late 2013, Batirashvili was replaced as leader of Jaish al-Muhajireen wal-Ansar by another Chechen commander known as Salahuddin, as most of the Chechen members of the group did not support Batirashvili's support of ISIL, due to their preexisting oath to the Caucasus Emirate militant group and its leader Dokka Umarov. By mid-2014, Batirashvili was a senior ISIL commander and Shura Council member operating in Raqqa, Syria. During this time, Batirashvili came to be known for using swarming and human wave tactics, most notably during the Siege of Menagh Air Base and Battle of Al-Tabqa airbase. He would use raw recruits for assaults, reasoning that the enemy would eventually be overwhelmed or run out of ammunition regardless of the casualties among ISIL fighters. Regional expert Joanna Paraszuk sarcastically remarked that Batirashvili's approach was based on the belief that "everyone want[s] to be a Shahid" (martyr). According to his father, Batirashvili called him once since he left for Syria to tell him that he was now married to a Chechen woman and had a daughter named Sophia. As of mid-2014, Batirashvili lived with his family in a large villa owned by a businessman in the town of Huraytan, just northwest of Aleppo. He is said to have overseen the group’s prison facility near Raqqa, where foreign hostages may have been held. By 2016, Batirashvili led special battalions of the Islamic State, in particular a unit named "the group of the central directorate", which appears to be the primary special forces strike force of the group. Batirashvili has been reported as being killed on numerous occasions. In 2014, there were reports that he had been killed in various parts of Syria and Iraq in May, June, August and October, all of which proved to be untrue. On 13 November 2014, Chechen leader Ramzan Kadyrov posted on his personal Instagram account that Batirashvili had been killed, and posted a photo of a dead ginger-bearded man. However, the man in the photograph was not Batirashvili, and Kadyrov later deleted the post. Before the post was deleted, the statement was picked up and reported on by many media outlets around the world. The US Treasury Department added Batirashvili to its list of Specially Designated Global Terrorists on 24 September 2014. On 5 May 2015, The U.S. State Department Rewards for Justice Program announced a reward up to US$5 million for information leading to his capture. There were further reports of his death in 2015: in May, June and October. On December 27, Russian News Agency TASS, quoting EIN news, claimed that American special forces had captured Batirashvili near Kirkuk in Iraq. This report was denied by a US Department of Defense spokesman. In March 2016, several unnamed U.S. officials told CNN that Batirashvili may have been killed in a targeted airstrike on 4 March near the Syrian town of al-Shadadi; however, they were unable to confirm his death. Other officials said that he had been "critically injured" in the strike, and that U.S. military intelligence were assessing whether or not he had died. On 12 March, the Syrian Observatory for Human Rights (SOHR) reported that Batirashvili had become clinically dead following the U.S. airstrikes, with the ISIL commander in a critical condition and unable to breathe without the use of life-support machines. On 14 March 2016, two U.S. officials told CNN that there was confirmation that Batirashvili had died after the airstrike. A U.S. military spokesman erroneously "confirmed" that Batirashvili had died outside ISIL's main stronghold of Raqqa in Syria. ISIL's media wing Amaq News Agency in a released statement denied that he had been killed. On 13 July 2016, ISIL announced that Batirashvili had died during battle in the town of Al-Shirqat in Iraq. The U.S. admitted that their previous claim of killing Batirashvili was incorrect and that they had targeted him again on 10 July 2016. They were still trying to verify whether Batirashvili had been really killed this time. U.S. President Barack Obama confirmed Batirashvili's death during a press conference a month later. On 19 July 2018, Turkish authorities announced that they captured five ISIS suspects on 4 July in Istanbul including Seda Dudurkaeva, wife of Batirashvili, whose father is Asu Dudurkaev of Chechen origin and clan Mulko/Chanti, a former Chechen minister, who was sacked by Ramzan Kadyrov from his position due to his failure to prevent his daughter from travelling to join her first husband, Hamzat Borchashvili, in Syria. On 24 July, Batirashvili's older brother, Tamaz Batirashvili, died from his wounds after being injured by a US-led airstrike in town of al-Shadadi four months earlier. ^ "Wanted: Information that brings to justice ... Tarkhan Tayumurazovich Batirashvili ... Up to $5 Million Reward". Rewards for Justice. ^ "Omar al-Shishani". counterextremism.com. Counter Extremism Project. Retrieved January 16, 2016. ^ a b c d e "Syria crisis: Omar Shishani, Chechen jihadist leader". BBC News Middle East. 3 December 2013. Retrieved 8 December 2013. ^ "Islamic State says top commander is dead; Pentagon unsure". ^ "Isis has confirmed the death of hugely popular 'minister of war' Omar al-Shishani". 13 July 2016. ^ a b "Chechen-led group swears allegiance to head of Islamic State of Iraq and Sham". The Long War Journal. 27 November 2013. Retrieved 8 December 2013. ^ a b "The Islamic State's Anbar Offensive and Abu Umar al-Shishani". War on the Rocks. 9 October 2014. Retrieved 13 January 2015. ^ a b "Al Nusrah Front commanded Free Syrian Army Unit, 'Chechen emigrants,' in assault on Syrian air defense base". The Long War Journal. 19 October 2012. Retrieved 8 December 2013. ^ a b Mroue, Bassem (2 July 2014). "Chechen in Syria a rising star in extremist group". Associated Press. Archived from the original on 14 July 2014. Retrieved 11 July 2014. ^ a b "Senior Islamic State military commander, 'emir of suicide bombers' among Treasury's terrorism designations". Long War Journal. 24 September 2014. Retrieved 13 January 2015. ^ a b "Wanted". Rewards for Justice. Archived from the original on 18 May 2015. Retrieved 24 December 2015. ^ a b "Rewards for Justice - Reward Offers for Information on Islamic State of Iraq and the Levant (ISIL) Terrorists". State.gov. Retrieved 2015-12-24. ^ a b "Daesh says top leader Omar Al-Shishani killed in battle". Arab News. 14 July 2016. Retrieved 2016-07-13. ^ a b Akhmeteli, Nina (9 July 2014). "The Georgian roots of Isis commander Omar al-Shishani". BBC News. Retrieved 9 July 2014. ^ "Father fighting in Iraq, the red-bearded "Chechen" told me that he really – Georgians". newsru.com. 11 July 2014. Retrieved 12 July 2014. ^ "Mujahideen Valley: How a Chechen from Georgia Became a Feared Leader of ISIS". The Intercept. 13 July 2015. ^ a b "'Omar The Chechen' Should Come Home, Says Dad". Sky News. 11 July 2014. Retrieved 13 January 2015. ^ a b "One of ISIS' top commanders was a 'star pupil' of US-special forces training in the country of Georgia". Business Insider. Retrieved 15 March 2016. 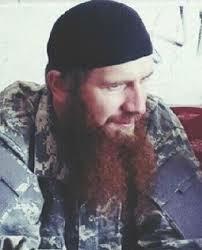 ^ "Chechen jihadists in Syria: The case of Omar al-Shishani". Al Akhbar English. 1 May 2014. Retrieved 15 August 2014. ^ "Syrie. Témoignage d'Omar le Tchétchène, chef militaire de l'Etat islamique". Le Monde. 4 December 2013. Retrieved 8 December 2013. ^ Roggio, Bill (20 February 2013). "Chechen commander leads Muhajireen Brigade in Syria". The Long War Journal. Retrieved 13 July 2014. ^ Roggio, Bill (28 March 2013). "Chechen commander forms 'Army of Emigrants,' integrates Syrian groups". The Long War Journal. ^ Ann Barnard, Hwaida Saad (5 August 2013). "Rebels Gain Control of Government Air Base in Syria". The New York Times. Retrieved 12 July 2014. ^ Leigh, Karen (5 August 2013). "Decoder: The Battle for Syria Begins". Syria Deeply. Retrieved 12 July 2014. ^ a b "Treasury Designates Twelve Foreign Terrorist Fighter Facilitators". Treasury.gov. United States Department of the Treasury. Retrieved 14 October 2014. ^ a b "Tarkhan Tayumurazovich Batirashvili". Rewards for Justice. 5 May 2015. Archived from the original on 18 May 2015. Retrieved 7 May 2015. ^ Vatchagaev, Mairbek (9 August 2013). "Influence of Chechen Leader of North Caucasian Fighters in Syria Grows". Eurasia Daily Monitor. Jamestown Foundation. 10 (148). Retrieved 13 July 2014. ^ Paraszczuk, Joanna (23 November 2013). "Syria Spotlight: Insurgent Split — The Dispute Between Abu Umar Shishani & His Deputy, Seyfullakh the Chechen". From Chechnya To Syria. Retrieved 7 December 2014. ^ Joanna Paraszuk (2 October 2018). "Chataev's First Big Battle: Tabqa Airbase, 22-24 August 2014". From Chechnya to Syria. Retrieved 10 October 2018. ^ "الشيشاني' و 'الشومينيه' .. حكاية 'جهادي' وجد الجنة في حلب'" ['Chechen' and 'Alhomnyh' ... The Story of A 'Jihadi' Who Found Paradise in Aleppo]. alkhabar-ts.com (in Arabic). Retrieved 12 July 2014. ^ Julie Hirschfeld Davis (24 September 2014). "Treasury Imposes Terrorism Sanctions". The New York Times. Retrieved 13 January 2015. ^ Aymenn Jawad Al-Tamimi. "An Account of Abu Bakr al-Baghdadi & Islamic State Succession Lines". Aymenn Jawad Al-Tamimi. Retrieved 15 March 2016. ^ a b "The Chechen Leader With A Grudge And The IS Commander With Nine Lives". Radio Free Europe/Radio Liberty. 14 November 2014. Retrieved 16 February 2015. ^ "La morte di al-Shishani, il comandante georgiano dell'Isis". Panorama. June 30, 2015. Retrieved January 16, 2016. ^ "ISIS leader al-Baghdadi injured in Iraqi airstrike on terrorist convoy — RT News". Rt.com. Retrieved 2015-12-24. ^ "Iraq, catturato da Forze speciali Usa il leader del Daesh Al-Shishani". Ilvelino.it. 2015-12-28. Retrieved 2015-12-29. ^ "Islamic State's de facto 'minister of war' possibly killed: U.S. officials". Reuters. 8 March 2016. Retrieved 8 March 2016. ^ "Top ISIS leader may have been killed in U.S. airstrike". CNN. 8 March 2016. Retrieved 8 March 2016. ^ "Islamic State's 'war minister' Omar al-Shishani 'clinically dead'". The Guardian. Retrieved 15 March 2016. ^ "IS group commander Shishani 'clinically dead:' monitor". Retrieved 4 May 2016. ^ Martinez, Luis (14 March 2016). "Top ISIS Commander 'Omar the Chechen' Believed Dead After Airstrike". ABC News. Retrieved 4 May 2016. ^ "ISIS commander Omar the Chechen confirmed dead". www.aljazeera.com. Retrieved 2016-03-16. ^ "ISIL denies Pentagon claims that Abu Umar Al-Shishani is dead". Al-Masdar News. 2016-03-15. Retrieved 2016-07-14. ^ "Pentagon admits 'Omar the Chechen' died this week, not earlier". Radio Free Europe/Radio Liberty. 15 July 2016. Retrieved 29 November 2016. ^ Starr, Barbara (14 July 2016). "U.S. working to confirm it killed top ISIS leader, again". CNN. Retrieved 29 November 2016. ^ "Press Conference by the President After Meeting with National Security Officials". The White House. 4 August 2016. Retrieved 8 July 2018. ^ "The Secret Life of an ISIS Warlord". Daily Beast. 27 October 2014. ^ "Wife of top Daesh militant al-Shishani captured in Istanbul". Daily Sabah. 19 July 2018. ^ "Mother of Seda Dudurkaeva, detained in Turkey, reports her daughter's attempts to leave IS". Caucasian Knot. 24 July 2018. ^ "Brother of Georgia-born IS Commander al-Shishani Reported Dead". Georgia Today. 25 July 2018. ^ "Brother Of Leader Of ISIL Abu Omar Al-Shishani Was Killed In Syria". Front News. 25 July 2018. ^ "Umar al-Shishani's brother killed in Syria". Caucasian Knot. 25 July 2018.